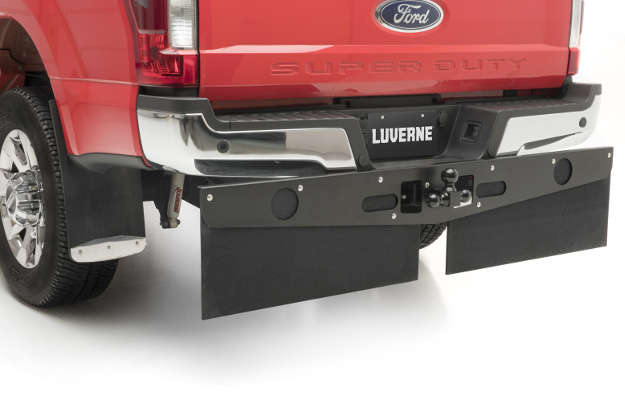 LUVERNE Textured Rubber Mud Guards are built to be highly dependable, hardworking rubber mud flaps for trucks. They feature a 3/8" thick construction and polished stainless steel plates for a unique flash of style and added durability. 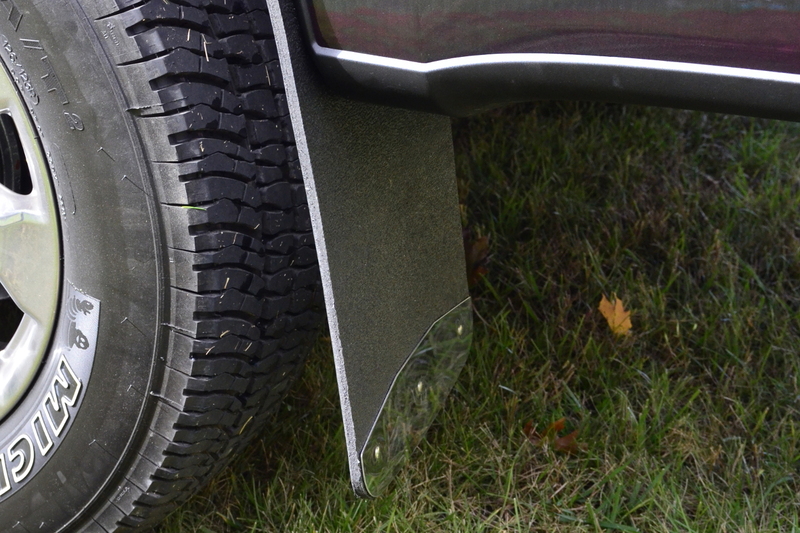 These truck mud flaps are made in the USA from recycled rubber. 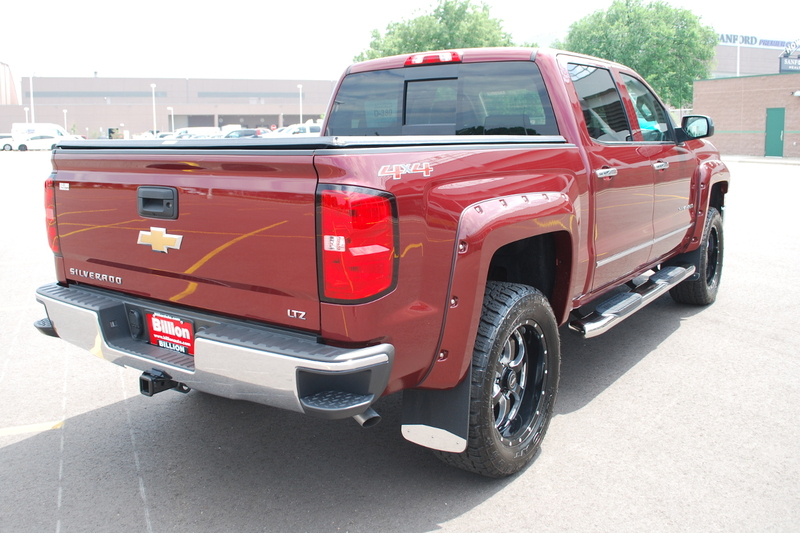 They install with vehicle-specific brackets for a custom fit, and they are available for a wide variety of pickup trucks, including select dually applications. 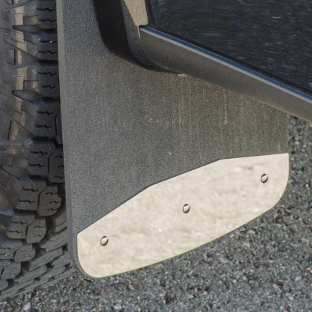 Mud Guards are the perfect mud flaps for work trucks and commercial vehicles. They provide the durability and reliable protection needed to withstand the rigors of the jobsite. 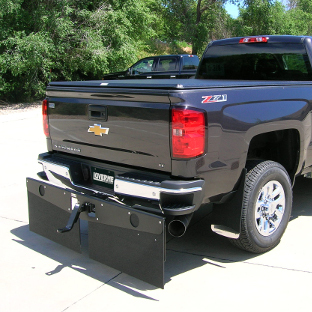 For towing applications, we also recommend our Textured Rubber Tow Guard, a use-as-needed, hitch-mounted mud flap system that protects your trailer against damage from road debris. 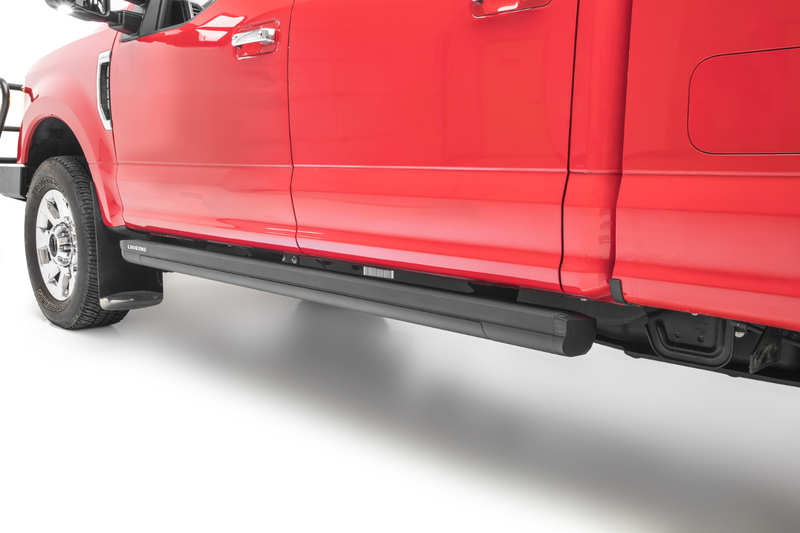 Textured Rubber Mud Guards provide excellent protection for your truck. They are constructed from 3/8" thick rubber, providing a solid barrier to deflect gravel spray and shed water and mud with ease. 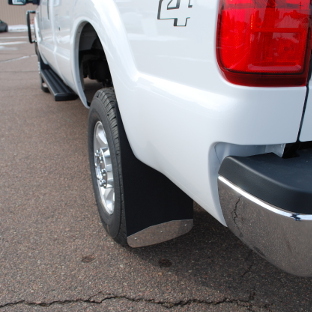 The 3/8" thick construction also gives the mud flaps the ideal amount of flexibility. 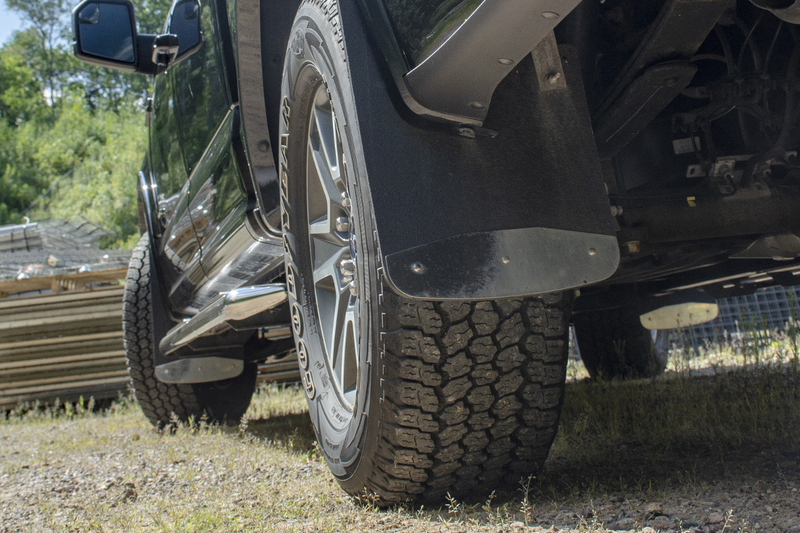 Unlike rigid splash guards, Mud Guards are able to move and bend with the movement of the vehicle, while their heavy-duty rubber build ensures a consistent shield against road debris. 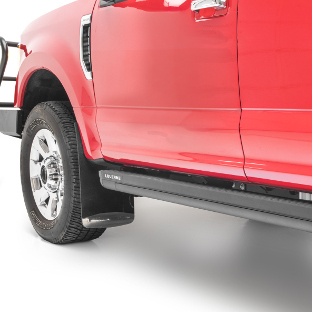 For additional style on your truck and increased longevity, these truck mud flaps are equipped with stainless steel plates. The plates are made from 18-gauge 436 stainless steel and provide enhanced durability in spite of an onslaught of rocks, sticks, mud, slush and more. 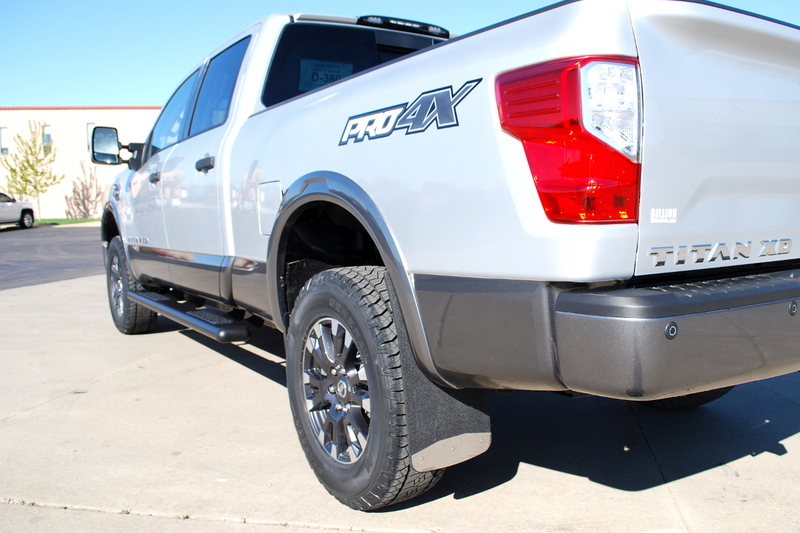 Naturally the stainless steel plates are highly corrosion-resistant, and we give them a high-polish finish for a bright shine and extra flash to customize the look of your truck. Scuffs, scratches and chips in the sides of your vehicle can quickly degrade its value. 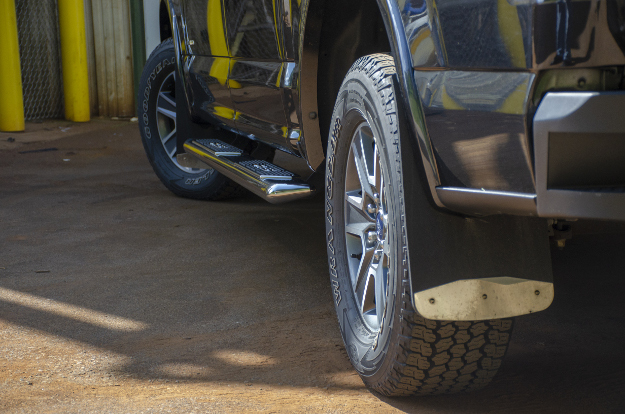 That is why our Textured Rubber Mud Guards are available for the front and rear of most pickup trucks, helping to preserve against this costly damage. 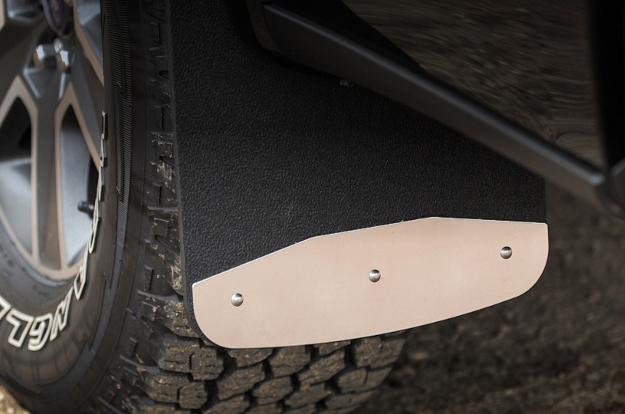 Mud Guards are ideal for work trucks and offroad builds. We offer sets for the front and rear separately, as well as in complete kits containing all four mud flaps for select applications. 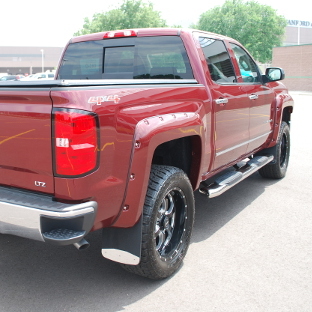 We also offer a unique extra-wide option for a variety of dually pickups. The rubber construction of our Mud Guards provides some extra advantages. First, we use recycled rubber. We proudly manufacture our mud flaps in a responsible manner, right here in the USA. 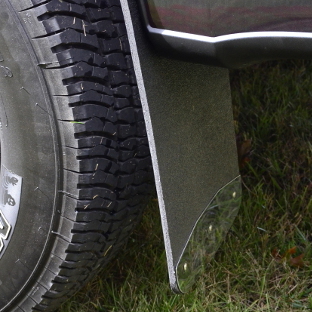 Additionally, LUVERNE Mud Guards feature a textured surface. 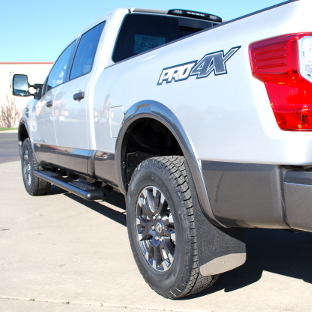 This promotes a cleaner, longer-lasting finish on the mud flaps in spite of constant exposure to the elements. The integrated texture hides minor scuffs, scratches and even grime left by road debris. 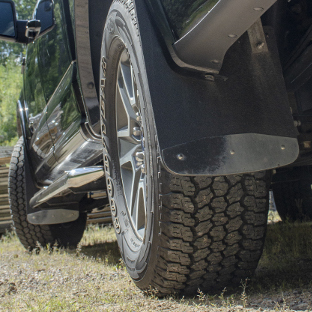 Textured Rubber Mud Guards are made with a vehicle-specific approach. We offer custom-fit sets for a variety of trucks. 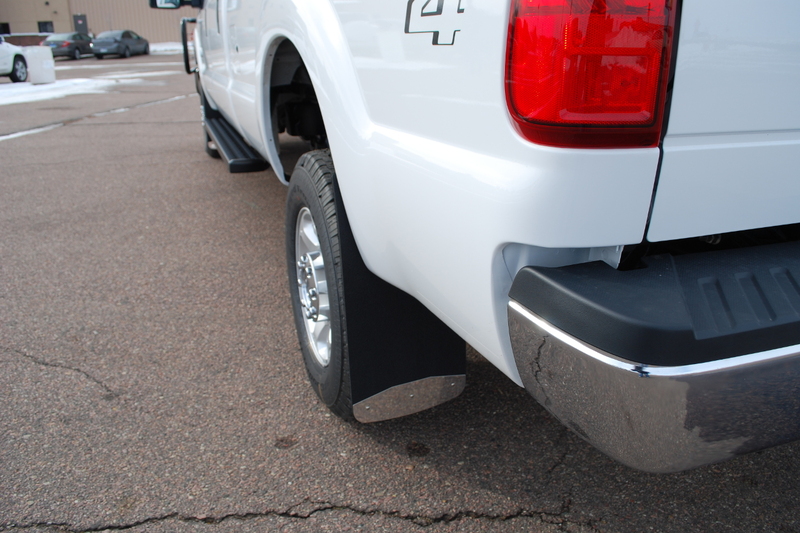 Custom mud flaps ensure an easy installation with as few vehicle modifications as possible. They come with all necessary mounting hardware for a complete install. The brackets are covered with a durable powder coat finish, and they mount using non-corrosive hardware for long-lasting dependability. 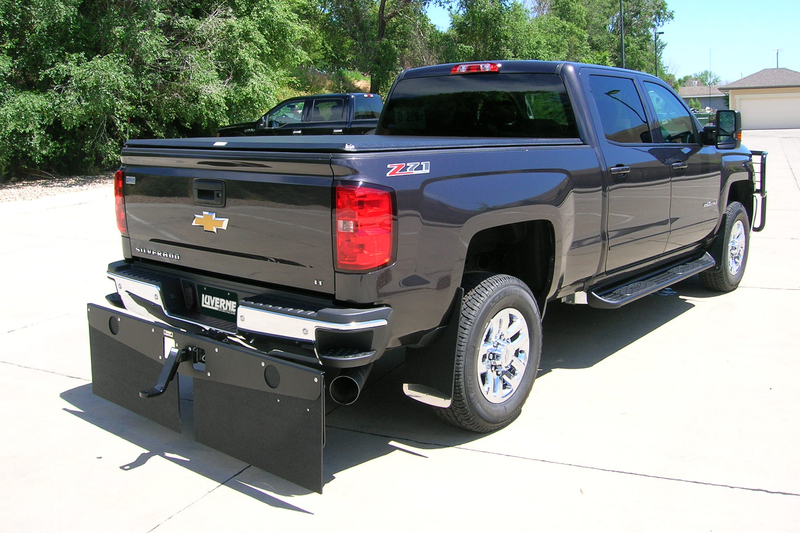 If a set of custom mud flaps is not available for your specific truck, we offer several universal Mud Guards. 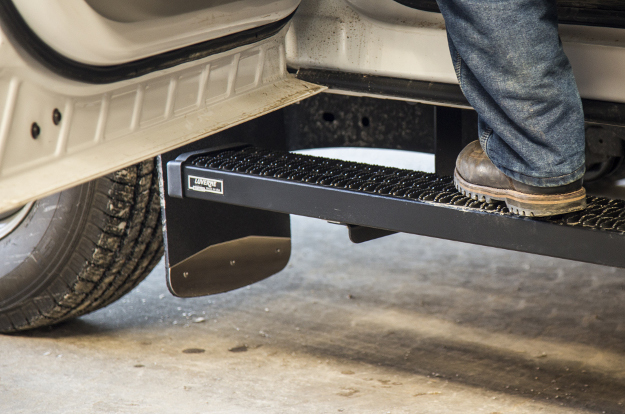 Although some drilling is required for installation, these universal mud flaps are great for work trucks, SUVs, cargo vans and other large vehicles. 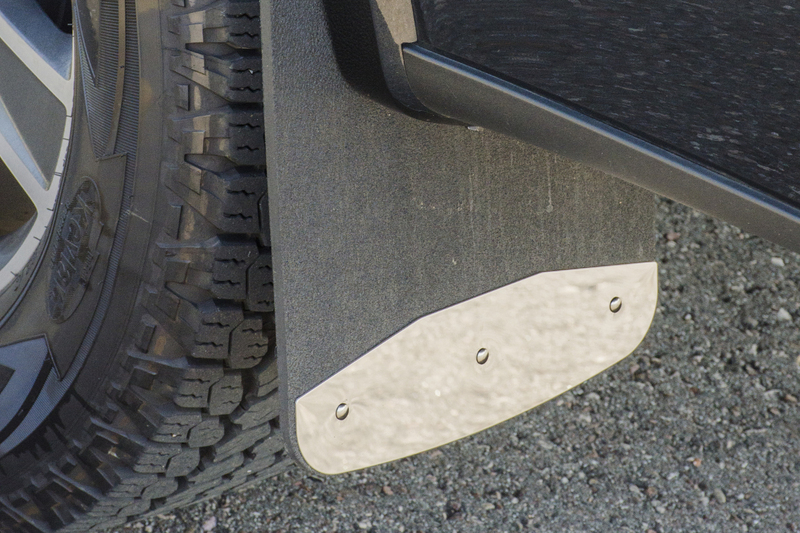 Universal Textured Mud Guards are available with or without stainless steel plates and come in the following sizes to provide the best possible fit for each vehicle: 12" x 20", 12" x 23", 14" x 23" and 20" x 23".